An expedition to the world's most southern continent in comfort while illywhacker waits patiently in Tasmania. Lyndall and I had plans to visit South America aboard illywhacker. 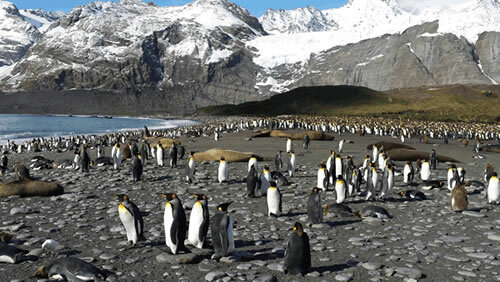 To make our way down the west coast from Puerto Montt, through the myriad islands to Ushuaia, the cruising world's most southern yacht-friendly harbour. 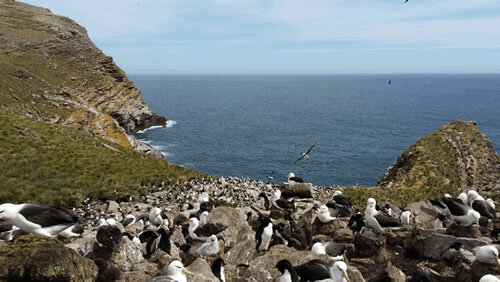 Friends had told us of the many protected, yet windy anchorages around this interesting crossroad between the Pacific and Atlantic oceans and, a most tantalising thought, the gateway to Antarctica. At the time though, cruising to Antarctica from Ushuaia seemed out of the question. 600nm to the Antarctic Peninsula across the notorious Drake Passage was bound to test both us and illywhacker, possibly beyond our endurance. Although her ferro hull had weathered the ice fields of Alaska this would be a tougher test, one with no way out if she foundered – we couldn't trigger our EPIRB and expect a rescue there. 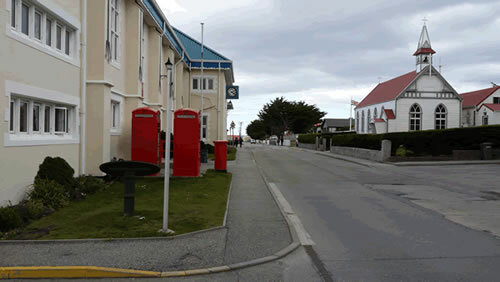 A practical solution we thought, even back then, might have been to take passage on a cruise ship from Ushuaia then continue aboard illywhacker through the Beagle Channel to Atlantic destinations northward. It was not to be. 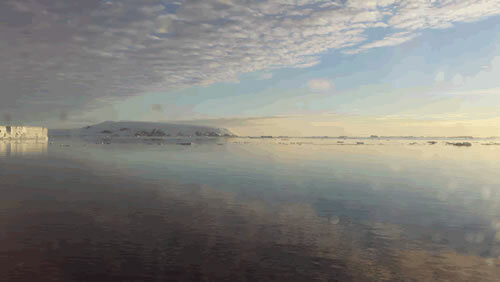 My dream of visiting Antarctica however has remained alive and the clock has kept ticking. If I was to make the journey, 2015 seemed a good year to do it. I seemed to have shelved the idea of cruising there so an alternative way of getting there had to be found. Life aboard illywhacker with Lyndall gave us the freedom to choose our own destinations in our own time and over the years we developed a natural aversion to cruise ships. In my new life with Alison though, a compromise I felt I could accept might be a research vessel with a relatively small number of passengers on an “expedition”, not a cruise. After some research, this is what we found...and it worked! So in case you may share such a dream, here's how it all happened for Alison and me. 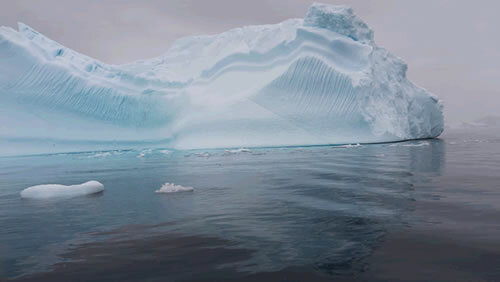 Following much research and conversations with Antarctic-experienced friends, Alison and I settled on OneOcean Expeditions. We could not have made a better choice. It was the most expensive holiday each of us have ever undertaken but the best, in experience, in value and in the unique memories we have brought home. OneOcean is a Canadian company with leases on two Russian ships. We were aboard the RV Akademik Sergey Vavilov, a well-stabilised, 114m Finnish vessel built for marine research and now well fitted out to accommodate about 90 guests. 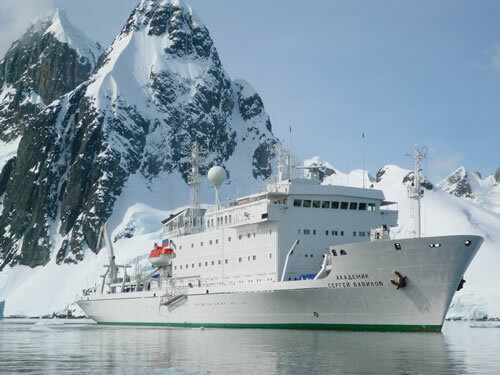 There were 45 Russian crew aboard, 2 scientists and 21 OneOcean staff consisting largely of expedition/adventure-experienced Canadians, Americans, Australians and Kiwis. 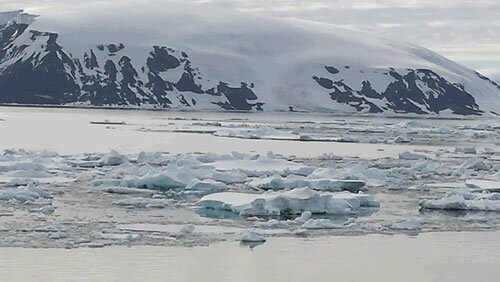 OneOcean is an affiliate of the International Association of Antarctica Tour Operators, "an organisation dedicated to facilitating appropriate, safe and environmentally sound private-sector travel to the Antarctic". IAATO has over 100 member companies from many countries so you'd think Antarctica would be a busy place in Summer. 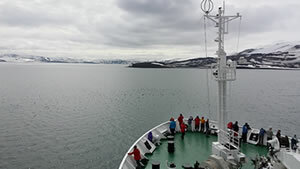 We only saw one other cruise ship in the distance and were impressed to learn that the year's program is co-ordinated in advance to achieve this isolation as well as in real time to manage weather and all other contingencies to ensure each ship offers a true wilderness experience to it's passengers. 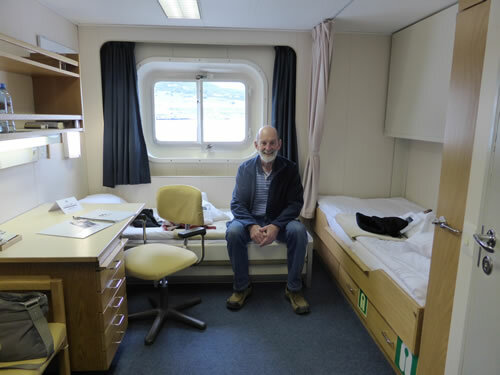 Our cabin on deck 5 had 2 lower berths and a private bathroom and plenty of stowage. We were allowed frequent access to the bridge on deck 6 where the lounge and outdoor viewing area were located also. 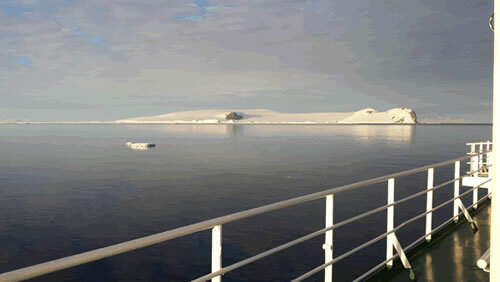 It's a unique feeling to be watching huge icebergs glide by while sitting in comfort at 20C, sipping a warm drink. Dashing outside for a below-zero photo opportunity was a regular activity as we spotted whales, dolphins and numerous birds, including varieties of the magnificent albatross. The dining room on deck 3 was not only the source of substantial nourishment but the place where we learnt of our regular expedition activities from OneOcean staff. This deck also held the “mud room” where we slipped on inflatable lifejackets as well as our supplied boots. These were disinfected prior to going ashore. 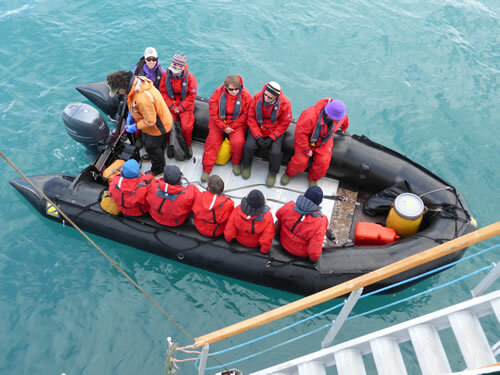 OneOcean also supplied outer wet gear which we donned in our cabin over our thermals and mid-layers. 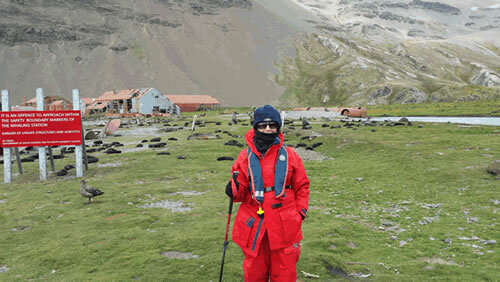 Together with double socks and gloves, neck warmers and a balaclava meant we were well kitted out for Antarctic climes. 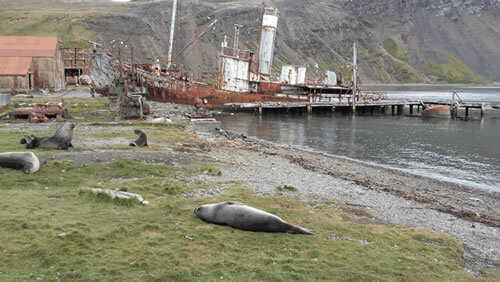 Excursions ashore were an essential component of the adventure and 12-passenger Zodiacs ferried us there up to 3 times in one day at different locations. Often these excursions would provide for kayaker trips as well. 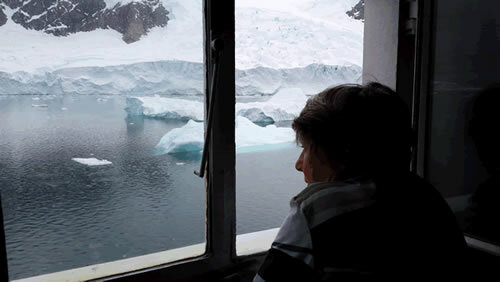 The skills and knowledge of OneOcean staff were constantly evident both on the water and aboard where lectures, talks and films kept us well-informed on many subjects including the history, wildlife, photography and current threats to the critical environment of Antarctica. We were well advised to include the archipelago of South Georgia in our itinerary. To include this destination our route took us from Ushuaia at the southern tip of Argentina through the Beagle Channel, NE across the Scotia Sea to the Falkland Islands, then SE to South Georgia before heading SW to the Antarctic Pensinsula. Out final passage home was to head North across Drake Passage back to Ushuaia. Each leg involved about 2 days of ocean crossing, the total time aboard the Vavilov was 19 days. In high latitudes weather plays a very important role in planning and managing the journey. Destinations can change at short notice and scheduled activities such as landings may be altered to a round-the-bay cruise by Zodiac or in the ship itself depending of wind, snow or shore-break conditions. We were unusually fortunate to experience mostly benign weather conditions. Nevertheless, our ever watchful crew gave us plenty of notice as to when seasickness tablets might be needed. The shifting-water ballast stabilisation system on the Vavilov worked so well that we queued-up for every meal and didn't miss any activity. 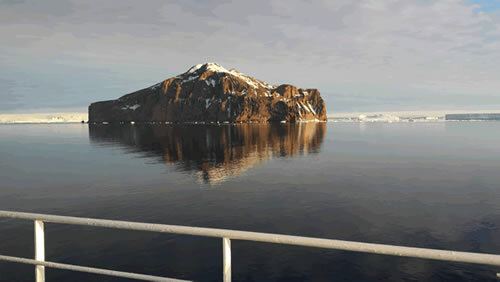 Every anchorage was unique in it's own way with each contributring to the overall highlights of amazing wildlife, stunning landscapes, whaling and exploration history or the pure feeling of wilderness. 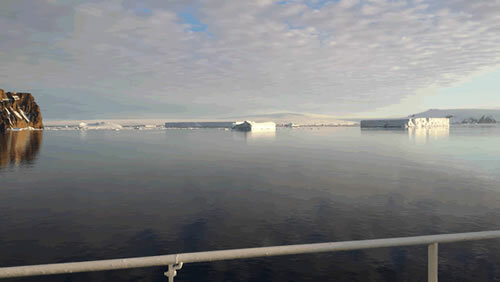 As we gained ever higher latitude, the inner warmth and comfort of the ship was an increasing anomaly contrasted against the absolute silence and magnificence of the ice and sky outside. Antarctica is Earth as it was since the beginning of time. Here is a quick photo story of our adventure recorded on my rather cold mobile phone. 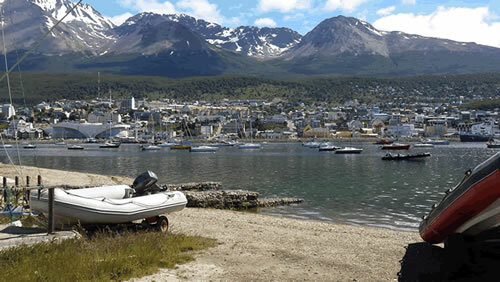 Ushuaia has a stunning mountain backdrop courtesy of Tierra del Fuego National Park. It is the Argentinian crossroads for cruise ships and adventurous yachts gathering at the “end of the earth” as the tourist T-shirts and souvenirs like to tell you. After a few days enjoying the town and the nearby National Park it was very exciting to catch a glimpse of the Vavilov as she entered port on the morning of the 28th December 2014. By 1700hrs that afternoon we began our boarding, ready to start our passage east along the Beagle Channel and into the South Atlantic for the 2-day passage to the Falkland Islands. One of many penguin rookeries we saw. These are king penguins. Alison, happy to be warm inside our cabin...wishing it would go on forever.